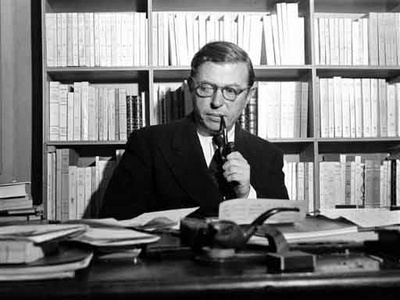 October 22nd 1964, Jean-Paul Sartre is awarded the Nobel Prize for literature, which he declines. In his novels, essays, and plays, Sartre advanced the philosophy of existentialism, arguing that each individual must create meaning for his or her own life, because life itself had no innate meaning. Sartre studied at the elite École Normale Supérieure between 1924 and 1929. He met Simone de Beauvoir, who became his lifelong companion, during this time. The pair spent countless hours in cafés, talking, writing, and drinking coffee. Sartre became a philosophy professor and taught in Le Havre, Laon, and Paris. In 1938, his first novel, Nausea, was published-the narrative took the form of a diary of a cafÉ-haunting intellectual. In 1939, he was drafted into World War II, taken prisoner, and held for about a year; he later fought with the French Resistance. In 1943, he published one of his key works, Being and Nothingness, where he argued that man is condemned to freedom and has a social responsibility. Sartre and Beauvoir engaged in social movements, supporting communism and the radical student uprisings in Paris in 1968. Also in 1943, he wrote one of his best-known plays, The Flies, followed by Huis Clos (No Exit) in 1945. In 1945, he began a four-volume novel called The Roads to Freedom but gave up the novel form after finishing the third volume in 1949. In 1946, he continued to develop his philosophy in Existentialism and Humanism. In the 1950s and 60s, he devoted himself to studies of literary figures like Baudelaire, Jean Genet, and Flaubert. The Family Idiot, his work on Flaubert, was massive, but only three of four volumes were published. Sartre's health and vision declined in his later years, and he died in 1980. Sartre is indeed the father of modern existentialism coming quite close to nihilism and declaring that the universe has no meaning, no purpose, no destination and the best we can do as human beings is to create meaning anew every day for ourselves, assert our freedom and bear responsibility for our individuals actions and beliefs. To my mind, the best example of this kind of philosophy is the play written by Sartre and titled “No Exit” where people find themselves in a room with no exit and slowly come to the realization that they don’t like each other and that they are in hell. It is hard to see however how can one espouse hope and avoid nihilism starting from the assumption that the universe has no purpose and no meaning. How does one assert one's freedom if one denies purpose and meaning and destiny? That other essential question proffered by Heidegger “why is there something rather than nothing” is never fully addressed by Sartre; and yet he could have found an answer by simply reading the father of existentialism who lived one hundred years before in Denmark: Soren Kierkegaard, whom he turns up-side-down thus ending in nihilism. Kierkegaard asserts that the destiny of man is to be aware of his freedom but his also creates existential dread and anxiety. So man takes refuge in a life of "quite desperation" as Kierkegaard puts it. So before reading Sartre one ought to read Kierkegaard first. Then one will be able to better assess Sartre’s philosophy and its import on modernity and the present sad scenario in the EU. I am not surprised to find my friend Paparella here, and while I agree with him in part, I do not completely. I was a teenaged boy on that wonderful day, and it made me admire Sartre even more than previously. Sartre proved by his refusal that he meant what he said, that he could not be bought. Brilliant!! Instead of Kierkegaard, I think Sartre can be better understood by reading Camus' Myth of Sisyphus. Indeed Larry, that other existentialism Camus made us aware that sometimes myths of old can deliver more truth than the "clear and distinct" ideas of the Enlightenment and that perhaps the Enlightenment has still to enlighten itself. One of my favourite thinkers/writers - And Camus even more so - along with Victor Frankl and his logotherapy theories; bold thinkers who made us aware that each individual must strive to define and find a meaning in one's life on one's own terms......couldn't agree more,and something that is needed even more so in this age of the meaningless alienated man attempting to find a meaning by loosing oneself in mass hypnotic pseudo-religious cults to salve the empty festering sore of their existence......cowardly choices at best....life must be lived with freedom,passion,and rebellion........thank you France for your wonderful thinkers!!! Four years later, I remain convinced that a reflective reading of Kierkegaard is indispensable for a proper understanding of modern existentialism.